Home » Economic Predictions » Is the Central Bank’s Rigged Stock Market Ready to Crash on Schedule? We just saw a major rift open in the US stock market that we haven’t seen since the dot-com bust in 1999. While the Dow rose by almost half a percent to a new all-time high, the NASDAQ, because it is heavier tech stocks, plunged almost 2%. Tech stocks nosedived while others rose to create new highs. Is this a one-off, or has a purge begun for the tech stocks that have driven the nation’s third-longest bull market? This is important because, without the nearly constant lead of those tech stocks, the market would have been a bear a long time ago. Tech stocks created half of the market’s gains in 2017. Financials, which led the Trump Rally, also hit the rocks in recent weeks, at one point erasing almost all of their gains for 2017, though they recovered a little of late. If both continue to falter, the rally rapidly implodes and maybe the whole bull market with it. Last Friday, of course, may be a one-off, but it may also be happening because central banks are pulling the plug on their direct ownership of the stock market or, at least, their hoarding of tech stocks. That direct cornering of the stock market largely went unnoticed until this past quarter. Central banks now have enough interest throughout the US stock market to be considered as having cornered the entire stock market, which means they have the capacity to let it fall or to keep it where it is by just refusing to sell their own stocks. Have central banks rigged the stock market entirely? Whether or not the market implodes now depends entirely on whether central banks let it fall. If they decide to continue to buy up all the slack, they may be able to keep it artificially afloat a lot longer because they can create infinite amounts of money so long as they keep it all in stocks so that it only creates inflation in stock values, as it has been doing, and not in the general marketplace. We have certainly seen that not much of it trickles from Wall Street down to Main Street. So, there is little worry of creating mass inflation from mass money printing. I have long suspected that central banks were the only force preventing the crash of the NYSE that I predicted for last year and that started last January, which was the worst January in the New York Stock Exchange’s history. Last week, however, was the first time I read something that indicates I was right about the Fed propping up the stock market in order to take us through an election year by the extraordinary means of buying stocks directly. It is no secret, of course, that central banks were attempting to create a wealth effect by pumping up stocks through their own member banks — buying US bonds back from banks with free overnight interest with the proviso that banks use the income to buy stocks. As I wrote during last year’s stock market plunge, even central bankers finally admitted to that. What is a secret is the fact that they have started buying stocks directly in order to pump up stock indexes. Federal Reserve chair, Janet Yellen, began talking openly about the possibility of doing that last year when it became obvious that the stock market was failing, and I speculated that the Fed actually started to do what they were talking about covertly through proxies so it wouldn’t show up on their own balance sheet. I wonder how many it bought last year when the stock market needed a recovery team. And that’s just one of the Fed’s friends, who was ready to rush in so as to suppress the Swiss franc. These banks are now following the Chinese model of crash protection. This is exactly what China’s central bank did on a massive scale to prop up its failing stock market and end the crash. It essentially nationalized many of its companies by soaking up all the slop in stocks. Will central banks now let the rigged stock market crash? If I was right about the Fed shoring up the stock market through proxies — and it appears now that I was — I also said all of last year that they would most likely only do that long enough to make sure Obama’s team won the election. If their recovery was failing as bad as I believed it was, I figured they’d do anything they could to continue to hold it up long enough to make get Team Obama (Hillary) elected. Trump, during his candidacy, was talking a lot about how Janet Yellen needed to go. So, you know the central bank would definitely want to keep Trump out of power. I noted how the Fed held mysterious closed-door emergency meetings last year, including one immediately called with the president and vice president. Also, if it became clear to them that their recovery was going to fail, they wouldn’t want their globalist friend, Obama, to take the blame — being globalists themselves — and certainly wouldn’t want themselves to take the blame for a recovery that failed the moment they pulled the stimulator’s plug out of the wall. They’d need a scapegoat, and they would love for it to look like the crash was entirely the fault of anti-globalists. So, their private motto, should Trump win, would be “Trump for Chump” if they knew everything was hopeless (as I’ve been saying it is for a long time because their recovery plan was always a horrible solution). Now that Trump has stocked his cabinet with Goldman Sachs Execs., however, Trump talks a completely different story about Yellen. She’s good now and valuable, and he says he’d like to see more loose monetary policy, so their reasons to eject him may be less pronounced; but, at the time, they didn’t know for sure if they could own him. And it may be all the more clear to them at this point that their recovery is going to fail as soon as they stop propping up stocks. Now that it’s clear central banks have been buying enormous flows of US stocks, this could explain why the stock market paradoxically rose right after the Fed announced its rate hike in March. Mysteriously, stock prices made their third largest post-FOMC meeting move upward right after their announced rate hike, an event that would normally send stocks down. Even Goldman Sachs said they found the move mysterious. In fact, Goldman noted that stock prices rose as a result of the Fed’s quarter-point rate increase as they would normally be expected to rise had the Fed lowered its interest target by that much. Goldman’s analysis was that this was “almost certainly not” the central bank’s desired outcome. Yes, “almost certainly not.” Perhaps I have an explanation for this mystery: The Fed appears now to have had friends in faraway places ready to backstop the market the second the decision was announced. I don’t know that’s what happened right at that moment, but we do know now that central banks have been directly supporting the US market this year and last with massive purchases. For their part, Goldman stayed with calling the event a mystery and said that the anomaly only meant the Fed would have all the more incentive to raise rates again at its next meeting. If you finally start to realize your recovery does not appear it is going to succeed — that it will never become capable of holding on its own — then you will really want the failure of your recovery to happen at a time when you can scapegoat someone else. One way to do that and not get blamed for the failure is to make sure you secretly give the market a huge jog with the right timing and severity to be sure it crashes on that person’s watch. To do that clandestinely, have your friends lift the market upon your first rate hike that year. That way you make the rate hike when you know the market cannot fail because friends are ready to prop it up, and you prove to everyone you have full confidence in your recovery, even though the only thing you really have confidence in is your own confidence game. The fact that the market rises when everyone would have expected it to fall gives you lots of justification for another rate hike due to the market’s now “proven” resilience to rate hikes. Then, you make sure your friends don’t lift the market when you make your next rate hike. You’ll appear justified in making the hike, but the market will fall from a greater height because of its artificial lift from your friends with more force as it essentially corrects to what is now essentially a double rate hike (since the first one never got priced in) once the artificial lift is removed. We now know some of that enormous stimulus was spent on US stocks. Well, having run that flag up the pole without hearing too much objection to the idea, is it too much to think that, when the market did fail badly last January, the Fed found other central banks willing to leap into that role for them? Why not? It was no secret that China’s move of that sort was the only thing that saved China’s stock market (though it also made it no longer a true market by effectively nationalizing many of China’s corporations). Of course, the Federal Reserve could own stocks directly that are hiding within some broad category on its balance sheet as well as any stocks that it still holds from its direct bailouts. They have already begun talking about starting the unwind of their massive balance sheet this year. If that includes an unwind of stock purchases, it will certainly bring the market down in Trump’s first year. If the Fed isn’t planning a stock-market failure by conspiracy, the question remains, will the Fed allow the stock market to fall even if they are just becoming aware their recovery won’t hold? On the conspiratorial side, that may just be the Fed’s best friend, Goldman Sachs, helping create the excuse the Fed needs for letting the market go. Why would Goldman want that? Well, so long as Goldman casts its bets against the market, they (and maybe this time their clients) could reap large rewards if the Fed lets the market go. They’d come out like champs. If the Fed’s recovery plan failed too soon after Trump’s inauguration,however, people would not automatically blame him, and any conclusion people reach on their own is far stronger held. That’s how a confidence game works. If the market fell right after he was inaugurated, people would possibly see it as a mess he inherited. If the failure was seen as something baked in during the Obama administration, the Fed would have to own its own abject failure because the Obama administration reigned throughout the Fed’s recovery program. Moreover, if the Fed’s recovery failed during the Obama administration, Trump’s victory would be certain because America always votes it pocketbook. While that was all speculation when I was saying last year, it does seem to be the way things are playing out. And now that it is clear central banks have been soaking up massive amounts of US stocks, it’s a little more than just speculation. 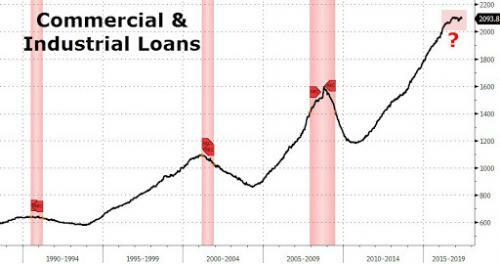 Why is loan growth finally slowing again? Simple. GDP and loan growth are showing us something that a rigged stock market cannot and will not. The Fed started raising interest rates, and immediately applications for new home mortgages and auto loans started to subside, and the recovery started to falter … just as I said would happen more than a year ago. 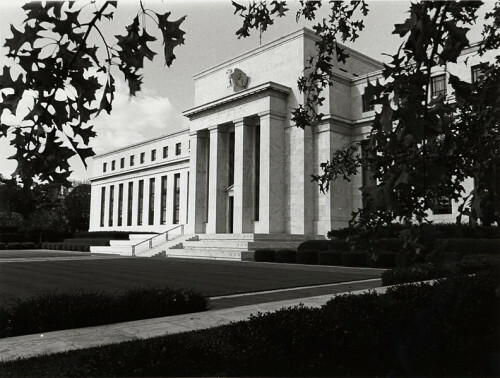 I’ve maintained all along that the Fed cannot raise interest rates (reduce its economic stimulus) without crashing its recovery (that, however, was without foreseeing when I first said it that they would prop things up via their potent proxies for a short time because that is simply moving central-bank stimulus from being overt to being covert). The Fed has a history of knee-capping its own recoveries by raising interest just as the economy is getting wobbly in the knees anyway, so we should not be surprised (even from a non-conspiratorial outlook) if the Fed fails to see its recovery is crashing all around it and raises rates directly into failure. Just recall how Ben Break-the-banky failed to see the last recession when he was standing right in the middle of it. The Fed has a peculiar talent for that. Sometimes I think conspiracy rises as the most likely answer only because its so hard to be believe that people who are that smart can be that stupid. Yet, Gentle Ben was either supremely stupid in the area of his supposed greatest expertise, or was lying about the lack of recession, which often happens when people are conspiring. So, you choose — stupid or conspiratorial. Either one is still going to take this market down.